懐かしい really took me a while to wrap my head around and even now, after nearly a decade of not speaking Japanese that word comes to mind in those times when no English word fits. It’s those times when a wave of memories hit as nostalgia would but with a more positive emotional charge. Another good one is “kiaⁿ-su” from Taiwanese. It’s feeling of fear that you’re losing out to others somehow. Like the people in Shanghai that like to cut in line and push on to the subway before you can get off are being kiaⁿ-su. How can you mention 忐忑 without linking to the 龚丽娜 song?! Ha ha… You’re right, I should have. It occurred to me while writing the article, and then I forgot. Really there are no English words to describe these emotions? Jiayou is more of an interjection than a noun although I suppose that is almost moot in Chinese. This list seems to be a bit of s stretch. 纠结, for example. Is indecisiveness not an equivalent? And is there really a ‘feeling’ between sympathy and empathy that even deliberate speakers can use consistently? I agree that 加油 is not really an emotion. It’s more of an encouraging phrase (with an associated emotion, perhaps?). Is 加油 really an emotion? I never thought about it that way. I don’t really know about the Japanese. But I always thought 加油 was like the Korean “Fighting!”. Not an emotion, but the fact that Chinese has a word for “mouth feel” I think tells a lot about exactly how the texture food is appreciated. 口感　(kou3 gan3)　for anyone interested. There’s another Chinese word from the infographic, which I’d never seen before (and I’ve been speaking/learning Chinese for quite a few years now): 豁达. Quite cool. As others stated above me, 加油 is not really an emotion but an interjection. And English has it as well, more or less – e.g. Go John! You can do it! Woo! etc. As for 纠结 I would translate it as “to be at a loss”. I wouldn’t really classify it as slang either – more an extended meaning of the original sense 缠绕联结 (“to be intertwined”). But it is an interesting emotion nonetheless. I was planning on doing a blog entry on Chinese emotions; so far I’ve only touched upon English emotions and Chinese personalities. This is an interesting meme, but I don’t see that it covers the root and exact definition of the English word “empathy”. 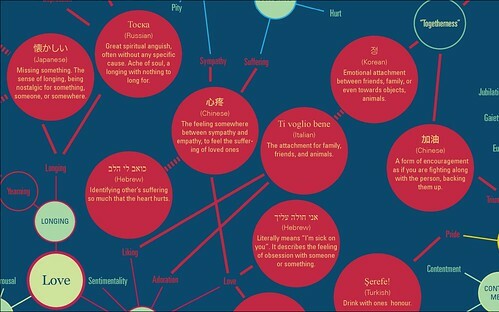 That is very different from sympathy and other words/feelings in between. As I understand Chinese, after living and working here for over 3 years and studying the language, talking to many Chinese about the topic, etc. is that the root meaning of the word empathy (the awareness and understanding of the feelings, thoughts, and point of view of others) does not exist for the Chinese. And many have said if the word, or comparable word/meaning does not exist in the language, than people have no way of learning it. This is why, I think, many foreigners feel that the Chinese appear be rude, uncaring, and selfish towards others in some situations. It may not be that they are these things, because maybe they are just not aware of it. From a societal and cultural perspective, have they been taught to take in to consideration or think about the feelings, state, and perspective of other people? Especially those outside their family or living area (village, town, city)? I like China and the people, and have chosen to stay here for a considerable time. But this one issue stands out for me as a big difference between China and cultures from the West. And it’s one that I explain to many non-Chinese as a major difference. I am curious if others feel this same way about the meaning of Empathy and if Chinese language has a similar word/meaning for the root meaning of the word.